Is there a minimum number of people required or maximum for an event? Our base package is designed to feed up to 50 people and costs $750. What style of pizza do you serve? Dante Wood-Fired Catering serves true Neapolitan style pizza which refers to anything done in the fashion of Naples, a port city in southern Italy. The ingredients used in our pizza is type 00 flour, San Marzano tomatoes for the sauce and cow-milk mozzarella from our local farm partner, Davey Road Ranch. Lastly, the pizza is finished in our wood-burning 800 degree oven. Are utensils, plates, and napkins included? Yes. We have non-branded, eco-friendly Chinet disposable plates, utensils, and napkins which are all included in the price. Events in Douglas County are included in the price of our packages. Events outside of Douglas County are subject to a $1.00 per mile fee from our Midtown Omaha Location. How many staff members are designated to our event? 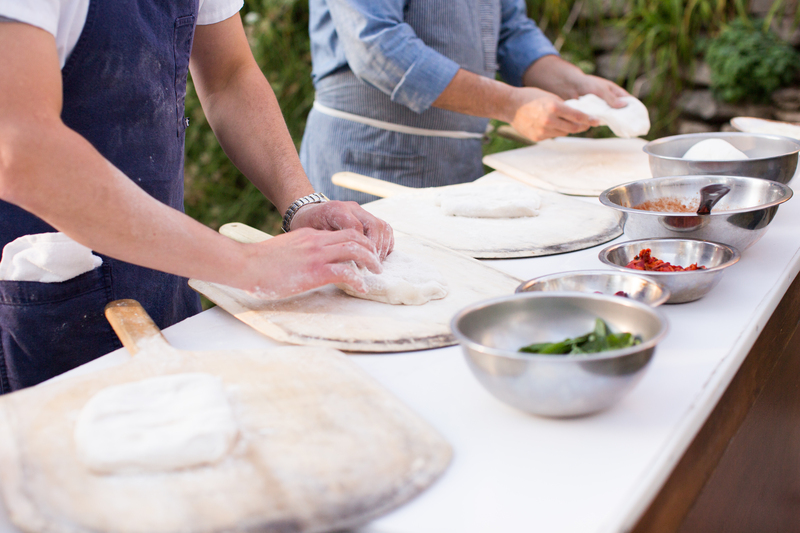 Pizza Cooks are included in the pricing for all events. Additional service staff are available at a rate of $40 per hour with a minimum of four hours. The oven has an awning that shelters the pizza prep area. Unfortunately, it is inadequate for very heavy rains and high winds. If the forecast is for severe weather, we can offer two alternatives. Either we can provide an alternative menu that can be served indoors. Secondly, we can re-schedule your event to an available date that works for you. If we have to cancel completely, we cannot refund your deposit. If weather reduces your event attendance, this will not reduce your final price as all terms have already been set and agreed upon. What space is needed for the truck? We require a dedicated and legal parking space approximately 40’x15’ to accommodate our van, oven and tent. What if I want to add alcoholic beverages? On private property we are licensed to provide a selection of Italian wine and Craft Beer. How do I secure/confirm my event? To secure your date with Dante wood-fired catering, we require 25% of the proposed balance in order to hold your date. This payment serves as the deposit. Once the proposal is approved and deposit paid, the client agrees to the policies outlined in this contract. Final headcount count and payment are due 72 hours prior to the event. When can I cancel my event? You may cancel your event at any time; but in chance of a cancellation, you will not receive your deposit back. If cancellations are made after the seventy-two hour deadline, all estimated charges will be subject to payment. Do you have a restaurant location? Yes, we have two locations! Dante is located in west Omaha at 16901 Wright Plaza #173. For more information, contact our Catering & Event Manager Emily Smith at esmith@dantepizzeria.com.